No one wants to be caught with a dead battery in their flashlight and serious users understand the importance of always carrying spare batteries with them. However, today’s high energy cells are not something you want to just carry loose in your pocket or pack. 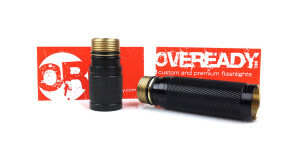 OVEREADY has a solution for gear junkies everywhere with their line of Delrin Battery Capsules designed to accommodate cells ranging from 34mm to 65mm in length, providing options for any of the commonly used battery sizes. All versions are machined from durable Delrin and feature the same threaded cap which can be fitted with an optional 20mm compass. A sample of the Extended Battery Capsule, outfitted with thermometer and compass, was provided by OVEREADY for review. The Extended Battery Capsule measures 100mm x 23mm and is designed to house a single battery, or combination of batteries, up to 70mm in length. This can include 1×18650, 1×176570, 2×18350, 2×16340 or even 2x123A lithium primary batteries. The cap attachment point measures 16mm x 5mm and allows several options for securing the Extended Battery Capsule on a keyring, paracord lanyard, or a strap. All corners are radiused providing a sleek, pocket-friendly design. Although the exterior looks smooth, it is actually covered with finely machined grooves to help improve grip. A Mil-Spec O-ring helps the threaded cap provide a water tight seal. The interior of the Extended Battery Capsule measures 19mm x 72mm and comes with a 12mm foam plug installed in the bottom. The plug can be trimmed or removed, if necessary, to support different battery sizes. In addition to the optional compass in the cap, the Extended Battery Capsule can also be equipped with an exterior facing compass or thermometer recessed into the opposite end. Thermometers are available with scales reading degrees Celsius or Fahrenheit. An AW 18650 3100mAh fits easily into the Extended Battery Capsule. The Delrin used to make the Extended Battery Capsule is really amazing stuff. It is definitely not a flimsy plastic and enables the construction of a lightweight yet very rigid tube. Delrin has many attributes that contribute to its widespread use, including its toughness at low temperatures (down to -40° Celsius), high resistance to repeated impacts, electrical insulating properties, and natural lubricity. It is also well suited for machining and is actually used in manufacturing as a replacement for some metal parts. The cap and body of the capsule mate perfectly and thread together easily with just a small bit of extra resistance as the O-ring is engaged. Once tightened, the cap is secure and showed no signs of loosening due to vibration or impacts. When loaded with an 18650 battery, the Extended Battery Capsule passed the “kitchen sink” test and showed no signs of water ingress after being submerged for over an hour. The optional compass and thermometer both worked well and appeared accurate when compared to other references. Of course the capsule can be used to store anything of value that will fit inside. I was able to fit 10 US bills inside although it was a tight fit and they were difficult to remove. As mentioned on the OVEREADY website, 5 bills fit quite easily. A single 18650 (or 2×18350) rechargeable cell fits snugly with very little, if any, rattle inside the capsule. Smaller diameter cells can be wrapped with a piece of paper or a US $1 bill to help take up some of the extra space. As its name implies, the Extended Battery Capsule is longer than comparable capsules due to the added space at each end for the optional compass and thermometer. Other versions are available without the exterior facing compass or thermometer resulting in a slightly shorter overall length. Pricing of the OVEREADY Battery capsules begins at around $20 but varies according to the options selected. For more information about the products mentioned in this review, visit the OVEREADY website or use the product links below. 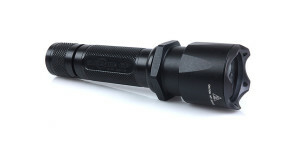 Posted in Flashlight Accessories, Flashlight Reviews, OVEREADY and tagged Flashlight Accessories, OVEREADY.